Last year, Nakilat Keppel Offshore & Marine (N-KOM) achieved an increase of almost 20% in the number of repairs handled at the yard compared to 2016. This was despite ongoing problems facing the shipping industry and the fall out from political issues between Qatar and some neighbouring countries. Most notably, the company reports that greater numbers of LNG carriers, tankers and offshore vessels made use of its facilities in the Qatari port of Ras Laffan over the course of 2017. While local owners provide a steady work flow, N-KOM has been able to attract several leading international tanker owners to carry out repair and maintenance projects at the yard. Notable contracts completed in 2017 include the repair of a VLCC for Singapore’s MOL Tankship Management. This project involved the renewal of the vessel’s side shell plating as well as the fabrication and supply of hydraulic pipes. 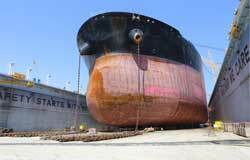 A repeat client, Euronav Ship Management (Hellas), awarded the yard a contract to repair a 299,533 dwt VLCC tanker. General drydocking repairs were undertaken, including hull high pressure washing, rudder repairs and propeller polishing. Major drydocking repairs were carried out for another Greek owner, Chandris (Hellas) on a 306,432 dwt VLCC tanker which underwent hull treatment and painting, cargo and ballast valve repairs, bottom plating steel renewal and overhauls to the main engine fuel pumps and turbocharger. The Shipping Corporation of India also proved to be a significant customer last year, docking three of its vessels with N-KOM. The scope of work on these product tankers included hull blasting and painting, the coating of deck pipelines and structures, repairs to windlass, mooring winches and chain lockers, overhauling main engine fuel pumps and turbochargers and propeller polishing. Approximately 70% of N-KOM’s tanker repair business in 2017 was from repeat clients. Other returning operators to dock tankers in Qatar’s last year included Dynacom, Maran Tankers, Samos Steamship, Eurotankers and Marine Management. The shipyard has a number of fleet agreements in place and is the preferred shipyard in the region for vessel repairs for Samos and the Angelicoussis Shipping Group, underlining its strong position in the Greek shipowner market. Aside from the routine dry dock repairs, N-KOM has completed a number of Schneekluth and Mewis duct installations on VLCC, Suezmax and Aframax tankers for Greek clients over the past year. These refits significantly reduce vibration and fuel consumption, thereby enhancing propulsion efficiency and voyage performance. N-KOM also continues to promote its capabilities in carrying out Ballast Water Treatment System (BWTS) refits to ship owners. To date the yard has carried out the installation of three different BWTS, developed by Samsung, OceanSaver and Alfa Laval respectively. N-KOM is now well established as one of Middle East’s leading shipyards, offering a comprehensive range of marine services as well as solutions for the oil and gas industry. Strategically located at the heart of oil and gas activities in the Arabian Gulf, the yard is able to draw on a wealth of experience and expertise from its parent companies, Qatar Gas Transport Company (Nakilat) and Singapore’s Keppel Offshore & Marine (KOM), to provide repair, conversion and construction services for a wide range of vessel types as well as offshore and onshore structures. Spanning over 50 hectares, the shipyard is equipped with three VLCC-size docks – two graving docks and one floating dock – and 3150m of alongside repair quays, with 15 cranes of varying capacities up to 100 tonnes alongside. The yard is also home to a growing number of maritime service providers, such as MAN Diesel & Turbo, Wärtsilä, Wilhelmsen Ships Service, Turbo Technik and Cargotec, among others.